Or view larger version. Political campaign poster urging California's Spanish-speaking voters to vote against Proposition 187. 1994. Maker unknown. Poster. Collection of Oakland Museum of California. Gift of Ms. Leticia Lara. 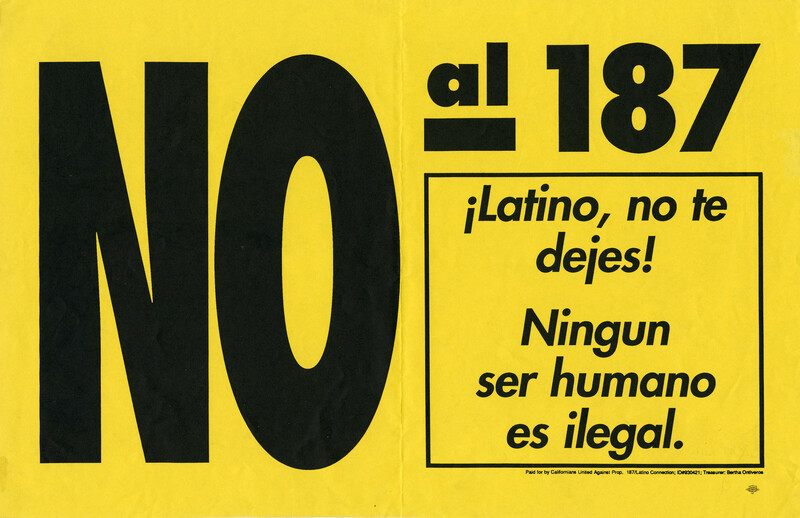 This photograph depicts a political campaign poster from 1994 urging California's Spanish-speaking voters to vote against Proposition 187. The initiative-also called the Save Our State (S.O.S.) referendum-sought to cut off health and social-service benefits for illegal immigrants, including the right of immigrant children to attend California's public schools. Republican Governor Pete Wilson championed the initiative. At the opening of the 1994 statewide campaign, Wilson, the incumbent governor, trailed his opponent, Democrat Kathleen Brown (the state treasurer), by 24 points, according to opinion polls. But he engineered a stunning political comeback by relentlessly emphasizing the dangers posed by illegal immigration, supporting the death penalty, and opposing affirmative action. Wilson won a huge 14-point victory over Brown, and Proposition 187 was passed. The new law was immediately blocked in federal court and ruled unconstitutional in 1998.